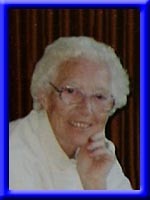 HANSON; Sheila “Billie”, 86, of Liverpool, Queens County, passed away peacefully May 26th, 2010 in Queens General Hospital, Liverpool. Born in Nuneaton, Warwickshire, England, she was a daughter of the late George and Beatrice Allen. Billie served in the Royal Air Force during World War Two in Air Traffic Control. After the war, she emigrated to Canada with her husband, John Hanson, an RCAF pilot and her baby daughter. She worked at the University of New Brunswick as a Bindery Supervisor for many years and retired to Nova Scotia’s South Shore in 1980. Billie is survived by her daughter Shirley Rose of Calgary, AB. Her grand daughters Cheryl Cruikshank of Holland Landing, ON. Cassandra and Tamara Rose of Calgary. Her grandsons David McMinniman of Calgary and Douglas McMinniman of Kelowna, BC , five great grandchildren, several nieces and nephews and her dear friends Smith and Ellis Anthony of Liverpool. She was predeceased by her husband John on January 26th, 1994 and her daughter Sandra Cruikshank on January 25th, 2009. Cremation has taken place under the direction of Chandlers’ Funeral Home, Liverpool, NS. No flowers by requestOnline condolences may be made to www.chandlersfuneral.com. rest in peace billie jean……. I worked with Billie at Graphic Services at Head Hall at UNB. Enjoyed working with her. I met her just before I got married. She used to tease me when Wayne my hushand now used to call she would say your eyes light up when you hear his voice. When your Dad and Mom lived on York Street they gave us an china cabinet that they were going to throw away. We used if for years. Sorry to hear about the death of your mother. I know you will have many pleasant memories of the happy times together. When Sandy and I spend afternoons in her room after school each day with the music on her record player turned to the highest volume…she would just smile…I remember a wonderful, kind mother to Sandy. My sincere condolences…. I am so happy that my Nana is with her soul mate and the love of her life. My mom (Sandy Cruikshank) now has both of her parents with her. I will miss her…she was an amazing woman and I admired her. I know she is happy now. I met Billie about 3 years ago. My girls, Mandy and Melissa and I spent a few afternoons with Billie and we all had such a wonderful time together. In just that short time we feel we got to know Billie so well and loved her very much. Whenever we go down to the ocean we will remember her and how much she loved it here in Hunts Point. When we go through the woods and down her road, she will always be in our thoughts and in our hearts. SHE WAS A WODERFUL WOMAN. I ALWAYS ENJOYED TALKING TO HER, SHE HAD A GREAT SENSE OF HUMOR. SHE TOLD ME A WHILE AGO THAT SHE WAS READY TO GO AND BE WITH JOHN. NOW SHE HAS HER WISH. I COULD NOT HAVE WISHED FOR A BETTER MOTHER-IN-LAW OR FATHER-IN-LAW THE BILLIE AND JOHN. THEY WERE WONDERFUL GRANDPARENTS TO MY DAUGHTER CHERYL. BILLIE WAS ALWAYS ABLE TO GIVE HER GOOD ADVICE AS SHE GREW UP.